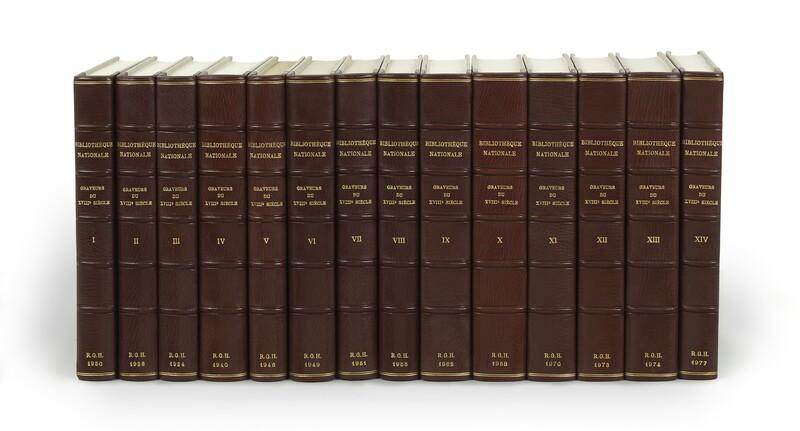 Twenty-nine volumes (28-29 cm), uniformly bound in collector’s quarter-morocco (23 volumes), or as issued in publisher’s bindings (6 volumes). - Indispensable catalogue of the holdings of French prints at the Bibliothèque nationale de France. A near-complete set of these three series, lacking two recent volumes, both still in print: Graveurs du XVIIe siècle, 13: Pierre Lepautre, issued in 2008 (in print, €115; ISBN 9782717723953; http://editions.bnf.fr/) and Graveurs du dix-huitième siècle, 15: Georges Louis Le Rouge: les jardins anglo-chinois, published in 2004 (in print, €60; ISBN 9782717723083; http://editions.bnf.fr/). 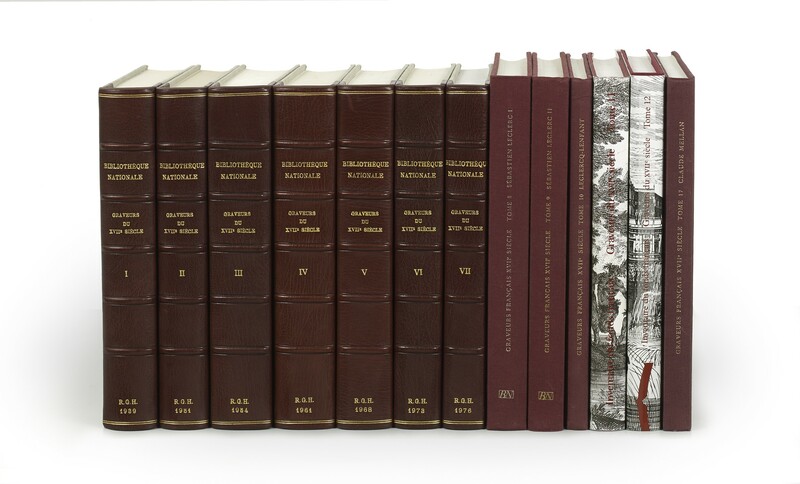 Five volumes are in facsimile reprints published 1967-1968; all other volumes are original editions. ¶ In superb state of preservation. (28 cm), 546 (2) pp. Collector’s morocco-backed cloth boards. - Facsimile reprint of the 1932 edition. (28 cm), viii, 470 (2) pp. Collector’s morocco-backed cloth boards. - Facsimile reprint of the 1938 edition. (28 cm), (4), viii, 17-556 (2) pp. Collector’s morocco-backed cloth boards. 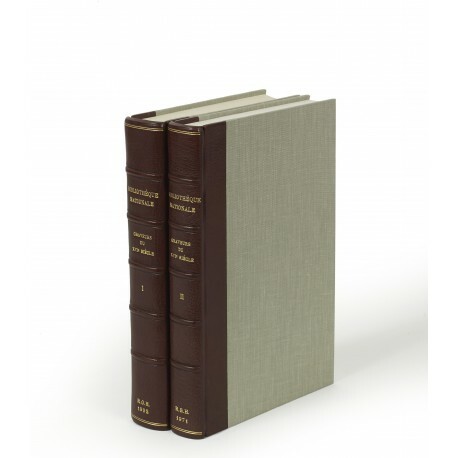 - Facsimile reprint of the 1939 edition. (28 cm), (4), ii, 560 pp. Collector’s morocco-backed cloth boards. - First edition, limited to 500 copies. (28 cm), (6) 528 pp. Collector’s morocco-backed cloth boards. - First edition, limited to 500 copies. (28 cm), (4) 600 pp. Collector’s morocco-backed cloth boards. - First edition. (28 cm), viii, 617 (3) pp. Collector’s morocco-backed cloth boards. - First edition, limited to 500 copies. (28 cm), (4) 570 (2) pp. Collector’s morocco-backed cloth boards. - First edition, limited to 500 copies. (28 cm), 472 (2) pp. Collector’s morocco-backed cloth boards. - First edition, limited to 500 copies. (29 cm), 341 (3) pp., illustrations. Publisher’s printed cloth (no dust jacket issued). - Original edition. (29 cm), 289 (3) pp., illustrations. Publisher’s printed cloth (no dust jacket issued). - Original edition. (28 cm), 185 (3), pp., illustrations. Publisher’s printed cloth (no dust jacket issued). - Original edition. (29 cm), 369 pp., illustrations. Publisher’s cloth binding, dust pictorial dust jacket. - Original edition. (29 cm), 335 pp., illustrations. Publisher’s cloth binding, dust pictorial dust jacket. - Original edition. (29 cm), 220 pp., illustrations. Publisher’s cloth binding, dust pictorial dust jacket. - Original edition. Cf. Maxime Préaud, “Les Mellan des cabinets des estampes de Bruxelles, d’Amsterdam et de quelques autres collections : supplément à l’Inventaire du fonds français : graveurs du XVIIe siècle, t. 17” in Nouvelles de l’estampe, volume 127 (1993), pp.21-27. (28 cm), 504 pp. Collector’s morocco-backed cloth boards. - Facsimile reprint of the 1930 edition. (28 cm), 502 (2) pp. Collector’s morocco-backed cloth boards. 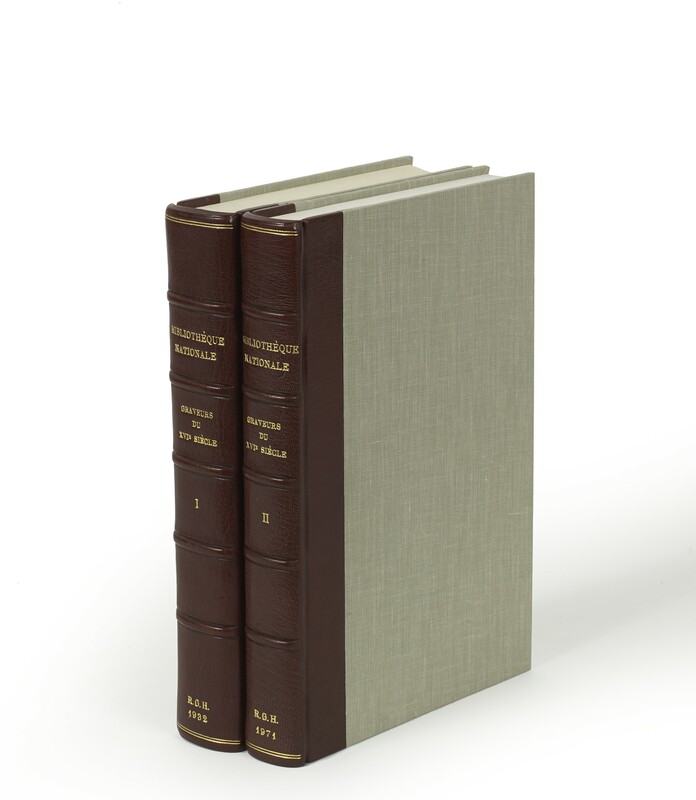 - Facsimile reprint of the 1933 edition. (28 cm), 517 (3) pp. Collector’s morocco-backed cloth boards. - Facsimile reprint of the 1934 edition. (28 cm), 661 (1) pp. Collector’s morocco-backed cloth boards. - Original edition. (28 cm), 546 (2) pp. Collector’s morocco-backed cloth boards. - First edition, limited to 500 copies. (28 cm), 612 (2) pp. Collector’s morocco-backed cloth boards. - First edition, limited to 500 copies. (28 cm), 491 (3) pp. Collector’s morocco-backed cloth boards. - First edition, limited to 500 copies. (28 cm), (4) 508 (2) pp. Collector’s morocco-backed cloth boards. - First edition, limited to 500 copies. (28 cm), (4) 562 (2) pp. Collector’s morocco-backed cloth boards. - Original edition. (28 cm), viii, 650 (2) pp. Collector’s morocco-backed cloth boards. - Original edition. (28 cm), (4) 635 (1) pp. Collector’s morocco-backed cloth boards. - Original edition. (28 cm), (4) 633 (3) pp. Collector’s morocco-backed cloth boards. - Original edition. (28 cm), 665 (3) pp. Collector’s morocco-backed cloth boards. - Original edition. (28 cm), 485 (3) pp. Collector’s morocco-backed cloth boards. - Original edition.